State Design Pattern is mainly for changing state at run-time. People can live with different financial status. They can be rich or they can be poor. The two states - rich and poor - can be converted to each other from time to time. The idea behind the example: people normally work harder when they are poor and play more when they are rich. What they do depends on the state in which they are living. The state can be changed based on their actions, otherwise, the society is not fair. Here is the class diagram. You can compare this with strategy pattern to get better understanding of the difference. 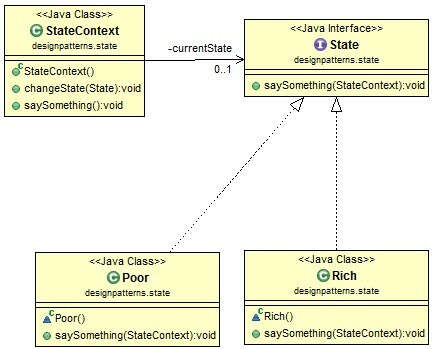 The Java example below shows how State pattern works. I see ugly code formatting, please fix it.